Muggy weather has a liquid antidote. For this, we can thank the British. They’re known for creating the logically mixed summer drink called a shandy: beer and usually lemonade (although other carbonated non-alcoholic drinks are known to qualify). I figured I’d walk you through some commercial examples, then experiment a bit with some of my own combinations. Prepare to be refreshed. Unlike the snake bite (beer and hard cider) and the dog’s nose (beer and gin), the shandy quenches instead of puckers. It’s usually very effervescent, which often requires the base beer to be either a light, crisp lager or a hefeweizen, which is a wheat-based beer. The biggest player among American shandies is arguably Leinenkugel’s Summer Shandy, a seasonal favorite. This Wisconsin brewery also makes a Lemon Berry Shandy, which has blackberry juice. Other breweries in the shandy game are Carib (which makes a teeny-tiny 1.2 percent alcohol by volume shandy) and Anheuser-Busch’s Shock Top. A Vermont-based brewer, Traveler Beer Co., has a line that’s exclusively shandies. Traveler has a traditional lemonade shandy, a strawberry shandy, and a ginger/lemonade shandy. The ginger shandy, called the Tenacious Traveler, is my favorite. Blended just right to have the ginger undercut the tartness of the lemony beer, the Tenacious goes best with other food, including salads. You don’t have to rely on what brewers consider to be a superior shandy. You can build one at home. And to save you from wasting your time experimenting with lemon flavors and base beers, I’ve wasted mine. 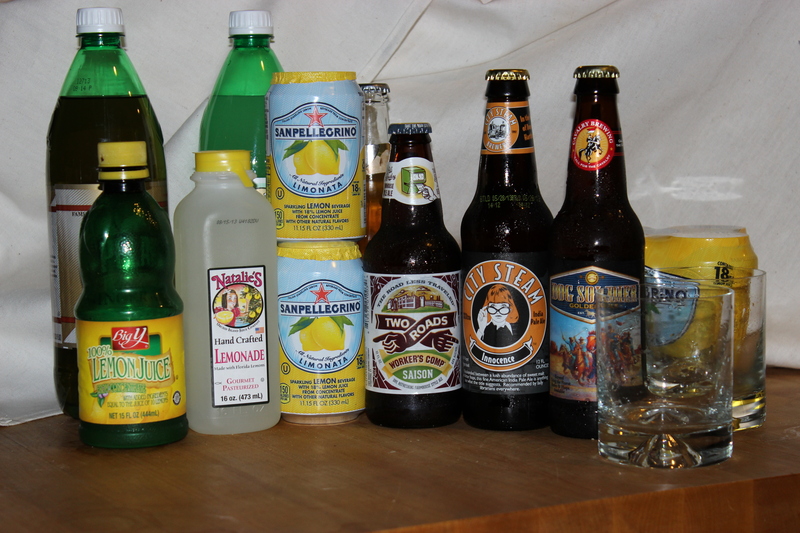 I made a few decisions before exploring ways to create a home shandy. I decided that I didn’t want to just dump beer into lemonade; the flatness of conventional lemonade would flatten out the beer. I also decided to use Connecticut beers as my base. For experiment’s sake, I chose a saison (known for its early, spicy character); a slightly bitter, aggressively citrusy India Pale Ale; and a low-alcohol golden ale. Using a not-very-scientific method, I blended the beers at varying ratios with San Pellegrino-Linomata (a soda with real lemon juice), Natalie’s Handcrafted Lemonade, Sparkling ICE Lemonade carbonated water, Polar Diet Half & Half (pineapple and lemon carbonated water) and straight-up lemon juice. First up was Worker’s Comp saison by Stratford-based Two Roads Brewing. Saisons are known as Belgian “farmhouse ales,” and are known for being a combination of sweet and tart with some spicy character. This wheat-based beer is great for summer and ideally doesn’t dominate any palate. Since Two Roads’ version is rather quiet and dry, I knew right away that it would work as a base. 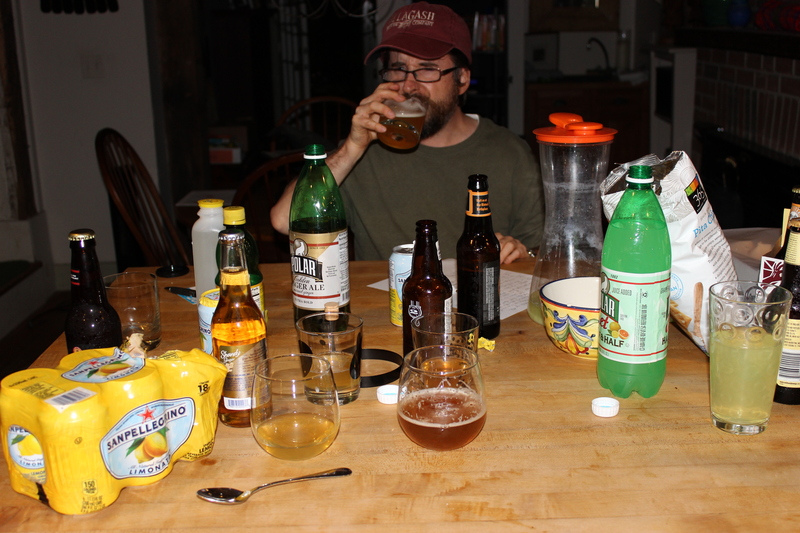 After a few sips of each combination, I found that my favorite was a 50-50 mix between the saison and the San Pellegrino Limonata. The lemon comes across very strong, but is made less bitter by the beer. Mixing it with Natalie’s Lemonade was just a sweet mess, and adding lemon juice to that was simply horrible. Next, I went up the hop ladder to Hartford-based City Steam’s Innocence IPA. India Pale Ales are known for their bitterness and citrus, or sometimes, piney nose. Innocence is made with a variety of hops, and the result is a slightly floral smell and a slightly grapefruity bite. Mixing this IPA with lemony additives was tough to swallow. I wrote with much pride in my notes, “bitter + bitter = bitter.” Genius. The best combination with Innocence was the Polar Diet Half & Half. I was surprised that the carbonated water mellowed out the ale so quickly, but while big taste was lacking in the final product, a refreshing and easier-to-sip drink had taken its place. I finished up with the Dog Soldier by Oxford-based Cavalry Brewing. This golden (or “blonde”) ale, is very mellow. By itself it’s kind of dry, and has an almost biscuit-like flavor. Frankly, it’s not a particularly distinctive beer. However, when I started blending it with my additives, I started loving the alchemy. It tasted great with the San Pellegrino, since there was no competing beer taste to mess with the lemon. It was even better with Natalie’s Lemonade, which brought out more sweetness that was balanced by the dry beer. 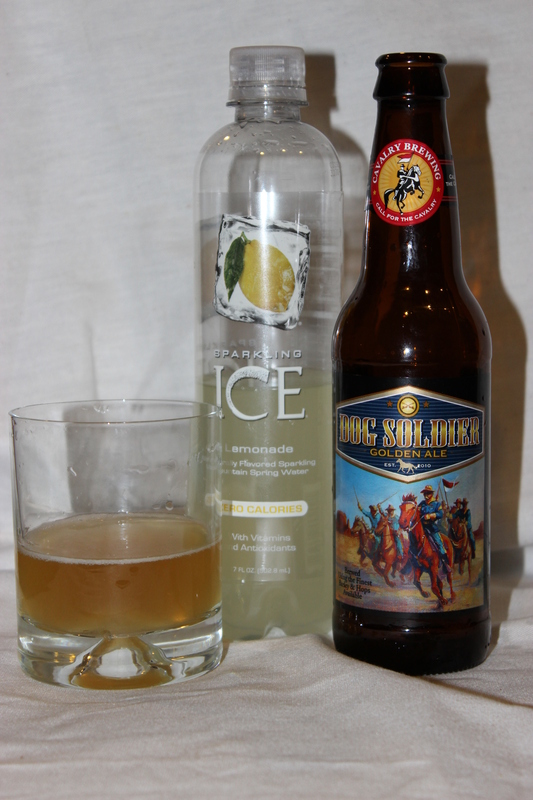 The overall winning combination, however, was a 50-50 mix of the Cavalry Dog Soldier and Sparkling ICE Lemonade. It was light, crisp and lemony but had just enough of a beer backbone to quench with carbonation and lay on a gentle buzz. This entry was posted in Beer Snob and tagged Cavalry Brewing, City Steam Brewing, shandy, Travelers Beer, Two Roads Brewing. Bookmark the permalink. ← Too Much Beer, You Say? Pshaw!